Last 5 trading days Nifty Futures is moving in a 100 point range. Volatility was greatly muted. On Wednesdays trading Nifty Futures attempted a fresh all time high before ending up with emotional liquidation in the second half of the session. Late Rallies and Late Liquidation are the game being played in the last couple of days. We are nearing the year end and just two more trading days left for this year 2017. Indicator sentiment continues to remain positive for 6 consecutive trading session. However Market Profile Sentiment turns out to be negative post the emotional liquidation on Wednesday trading. Put writers are still over aggressive at 10000PE, 10100PE, 10200PE, 10300PE, 10400PE & 10500PE which is a worrying concern for a sustained uptrend. Too much of put writing indicates highly overconfidence trading environment possibly dominated by laggard buyers. On Wednesday trading session price resisted mechanically at 10600 with a poor high formation followed by inventory adjustment and repaired back to back prominent POC. Trading scenario on Wednesday trading was the short term inventory was dangerously went long to too long followed by inventory adjustment. 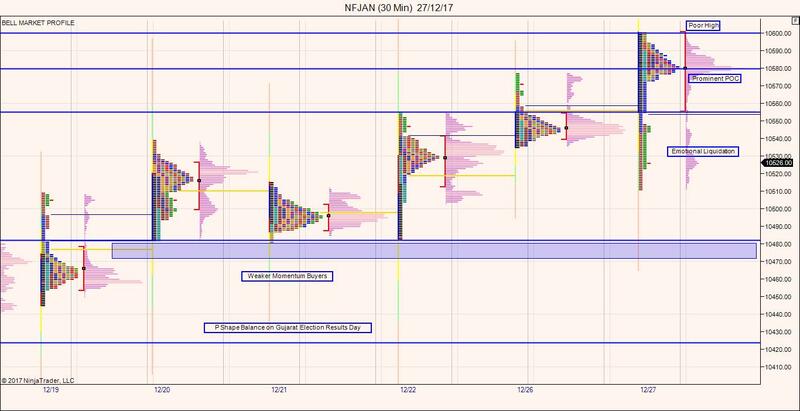 From the Market Profile Charts weaker momentum sellers are witnessed in the last couple of trading session indicating a possible mechanical stop setup at 10482 reference level in Nifty Jan contract. scale back above 10600 levels and higher. If there is any meaningful continuation on downside then possibly 10373 – 10423 is the next reference in Jan series to look for any possible support. Price acceptance below 10373 – 10423 band and holding below can drag nifty futures towards 10000 or even lower levels.